HON Preside Cafeteria Table Base HONTLRAC $309.04 Cylinder base easily attaches to 42 or 48 round tabletops of the HON Preside CafeCommons Series. This series helps create open, flexible spaces where people can get together to eat, drink and be productive. 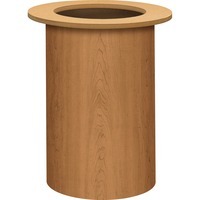 Tabletop features a traditional edge and durable Harvest laminate that is scratch resistant and easy to clean. Underside of top features an alignment guide for base placement. Round tabletop is sold separately.